An invoice is a kind of commercial document that defines a financial transaction explaining what product or services have been purchased from vendors, suppliers, salespersons by the company. An invoice comprises details like date, service details, vendor details, time, terms etc. With the help of invoice, accounting department can track every single financial transaction. In businesses, an invoice can be called as a thread that explains every aspect of cash flow statement. Being an entrepreneur, you can identify your customer and can update the database. But this task become hectic when comes to data entry which requires precision, workers and lot of time and money. In a year more than a billion invoices were exchanged all over the world and 90% of those invoices were still processed manually. For accounting firms, this means time, money and resources wasted on manual data entry and employees left feeling unfulfilled in a repetitive job. Manual data entry is a run off the mill practice in accounting firms in this modern age. Firms are overspending for data entry tasks such as the handling of data boxes, downloading of statements, rewriting and other recurring activities. Recent university graduates are being hired for rewriting positions — a job so routine and tedious that their skills are not being matched with their assigned tasks. This workforce is much too expensive for their time to be wasted on simple data entry. Firms are hiring these “experts” when they are really better suited to more complex roles. A company’s assets are its employees and its technology and both need to be fully utilized. Typing over information from invoices is not a pain felt just by large enterprises and service centers. The same activity bogs down smaller companies, individuals and particularly accounting companies. But Imagine a world without data entry, Imagine running a business where invoices are automatically entered into your accounting system, Imagine having computers do all of your work. 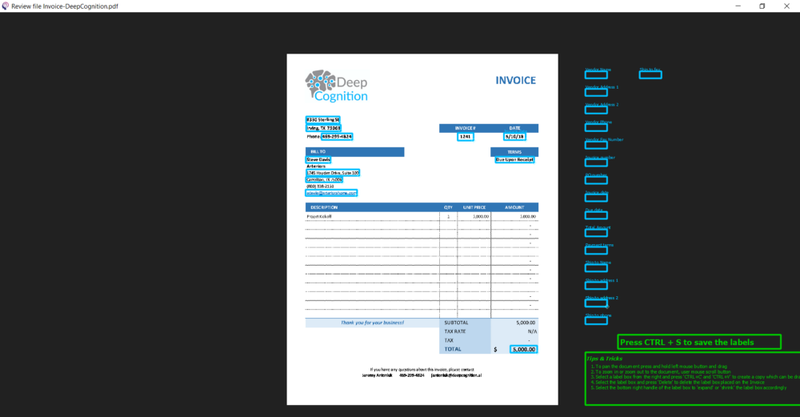 Invoice Robot is developed by DeepCognition who’s motto is to turn imagination into reality .It’s dedicated to creating a world without manual data entry, putting an end to these monotonous and tiresome tasks still done by humans. 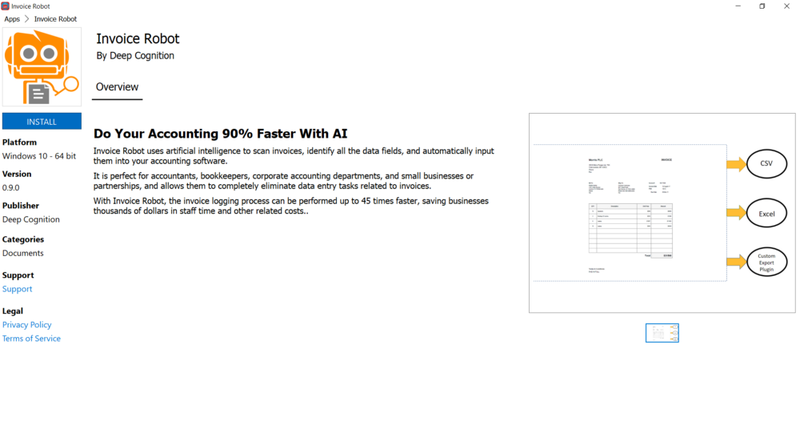 Invoice Robot uses artificial intelligence to scan invoices, identify all data fields, and automatically inputs them into your accounting software. 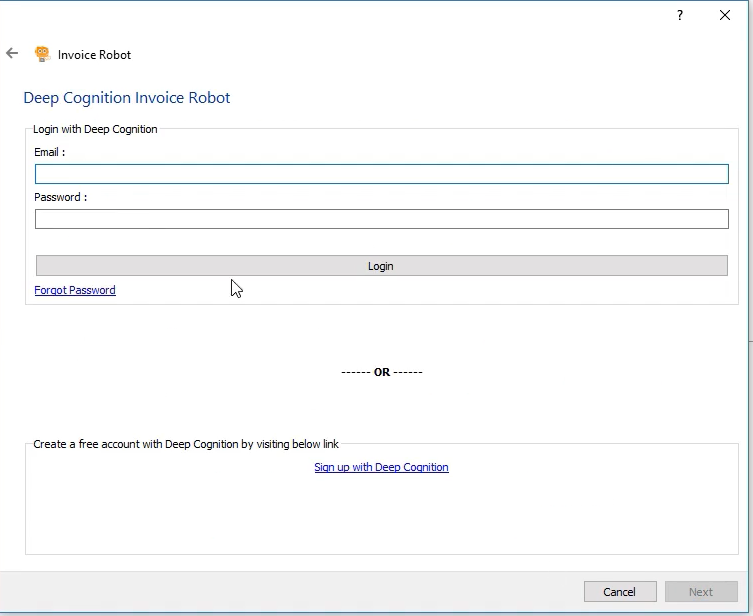 Invoice Robot can be installed through our AI Appstore (Supports only Windows 10 for now ) developed by Deep Cognition. AI AppStore by DeepCognition is a marketplace that brings best AI applications to businesses without hassle. They work with best AI developers to bring you these applications. Their approach to AI AppStore is very simple. They like to bring the benefits of AI to all businesses without having them to hire expensive engineering teams or needing to do large custom development effort. solves an end business use-case. 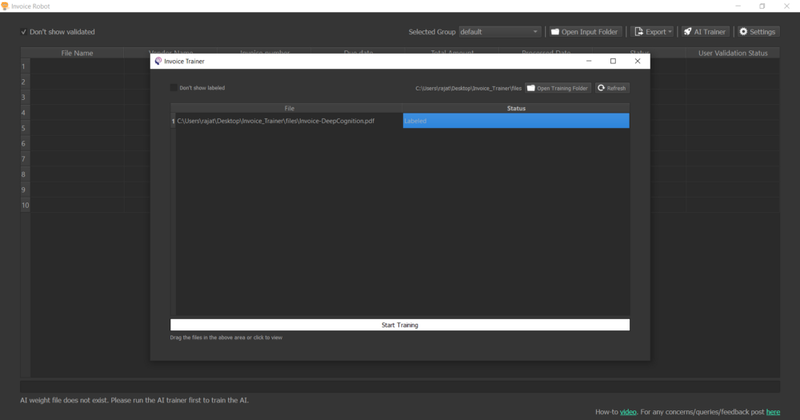 are end user installable and usable through intuitive GUI (No IT team needed). provides customers with ability to train AI with their own data. 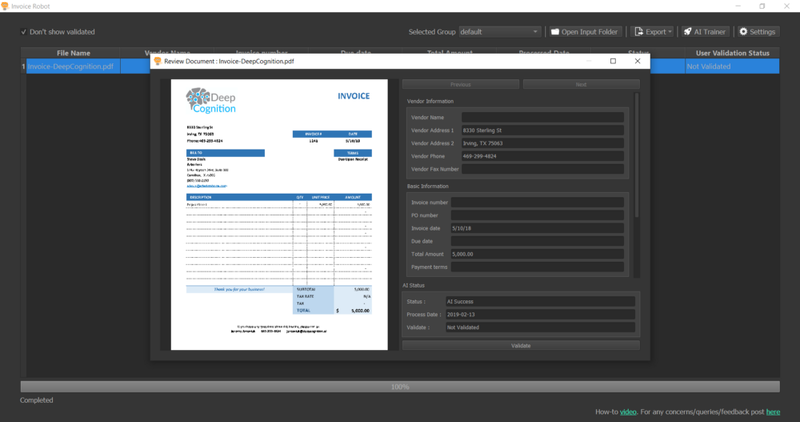 Invoice Robot is a software created by DeepCognition which through the use of artificial intelligence software,it recognize all data on an invoice, and directly input it into your accounting software. It is compatible with Quickbooks, Freshbooks, Xero and many others are on the way. Invoice Robot receives a scanned copy of your invoice, then starts looking for data fields. It will find fields such as date, invoice number, tax, quantity, description, price, due date, line items and much more. 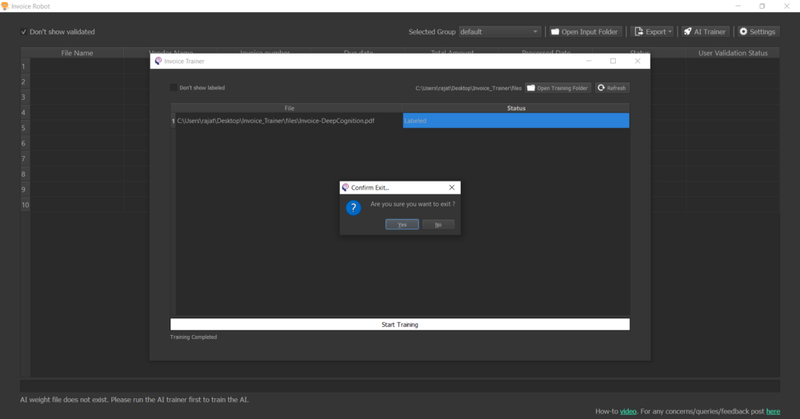 First you need to download and install AI app store available on Deep Cognition website (Supports windows 10 only for now). After installing the AI app store launch it. There you will find different apps published. Today we are going to install Invoice robot. Click on the Invoice robot app and install it. 4. After it get installed launch the app and login with your Deep Cognition account. If you haven’t register yet then sign up from here. 5. 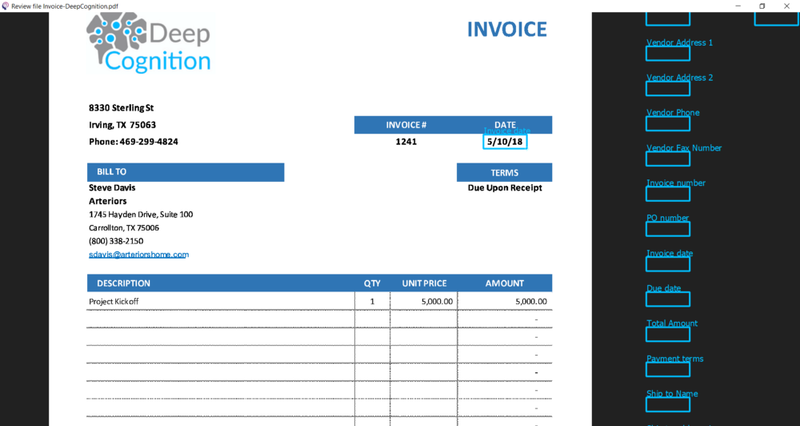 Now to get start with invoice robot first you need to train your model with your sample invoice so that it can extract information in future from other similar format invoice. 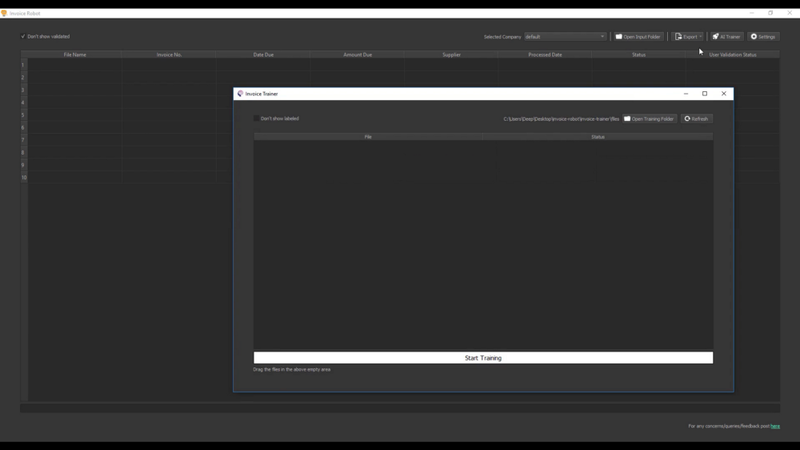 For this open the AI trainer and save the invoice pdf files in the training folder by clicking on the Open Training Folder option. 6. Before starting the training you need to first label the data for required files. 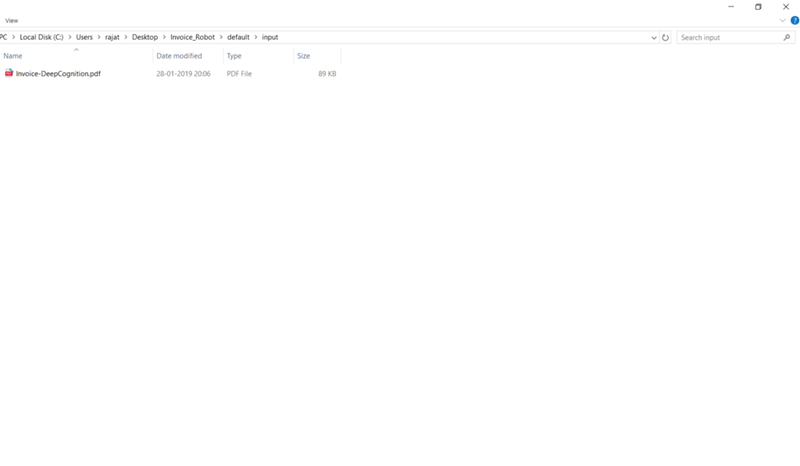 So click on the input data file this will open the UI for selecting different field. Now you will find all the available fields on the right side and the invoice on the left side. 6.1) You can zoom in and out the image using the mouse scroll. 6.2) To pan the document press and hold mouse left button and drag. 6.3) Now to set a field for eg. Invoice data from the right. Click on the invoice data option and use CTRL + C and CTRL + V to create a copy which will be dragged on the image at right location. 6.4) Adjust the size of the box and fit the value inside it. 6.5) Repeat this step until all the data fields are set properly. 6.6) Now press CTRL + S to save the labels and close the file. 7. Repeat this procedure for all the input data for training. Now after this all the input pdf will have Labeled status. Now start training your model. 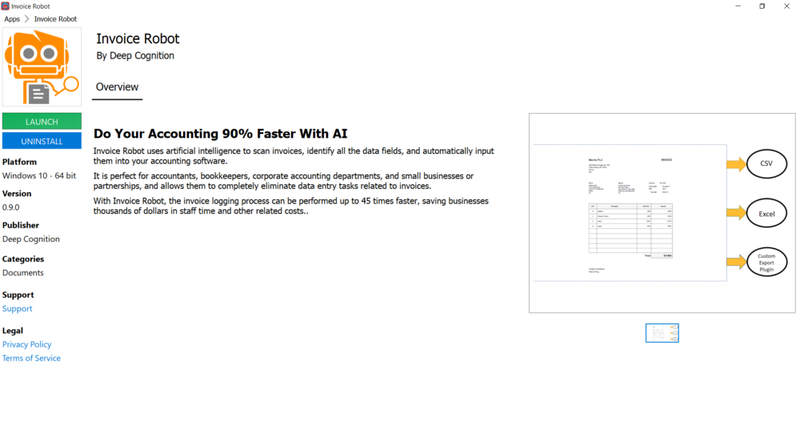 Note: Best part of invoice robot is that it does not require any cpu or gpu for training. The training will be done directly on the cloud. You just need active Internet connection and make sure your system will remain running until the training is completed. 8. After completing the training close the AI trainer. 9. 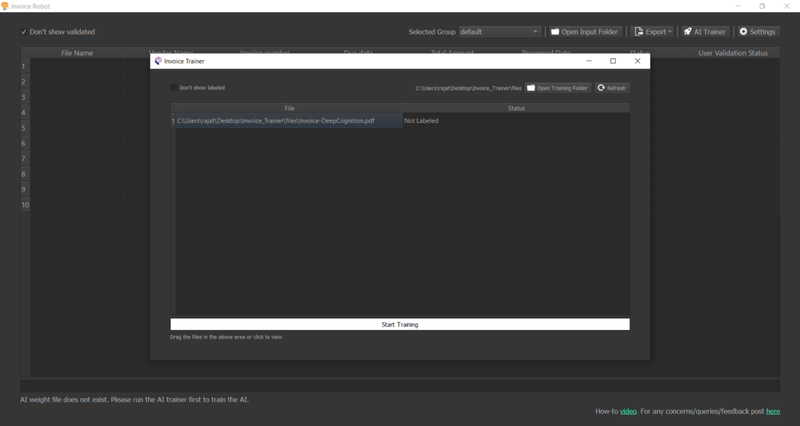 Now it’s time to add the input data for prediction. 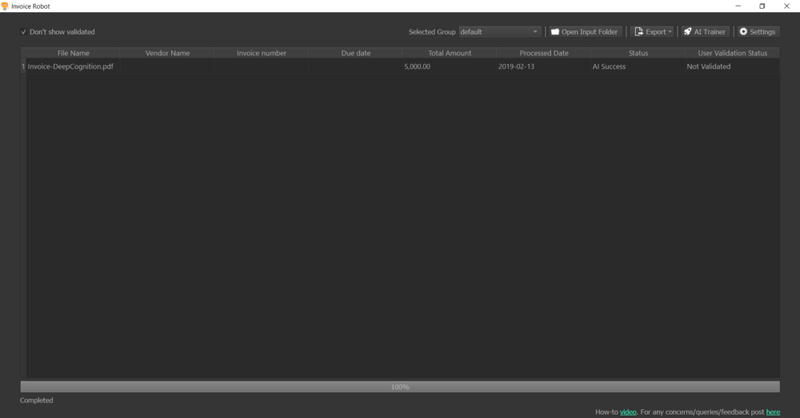 Open the input folder and paste all the input invoice pdfs. Now the invoice robot will automatically extract the information from the pdfs. 10. One of the best feature of Invoice Robot is that after extracting information you can validate them and if there is any mistake you can easily correct it. If there is any error or any missing field then select the field and move the cursor to its value. 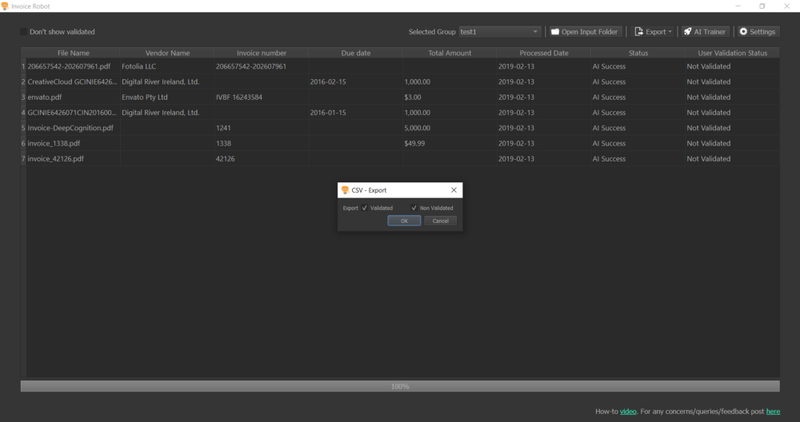 You will see a small box around that value click on that and it will store that value in the field. After validating the invoices its time to export the data into different accounting system. 11. Click on the export data and select the format in which you want to save the information. 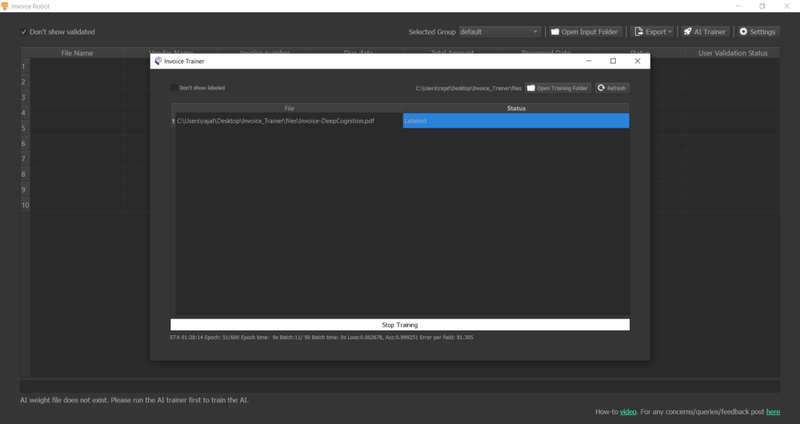 You can select which data to export either Validate or Non- Validate or both. Save the file at your desired location and your data will be successfully stored. • No need to upload invoices to the cloud — Our hybrid computing model uses your own computer and cloud as necessary for AI processing. You will find all the information and steps in the documentation. You are using your time to read my work means the world to me. I fully mean that. If you liked this story, share it with your friends! if you want to! I would love that.